It’s that time of year again… It’s NURSES WEEK! That one week we are really good at tooting our own horns and enjoying the love that everyone shows us. It’s a week of free lunches, maybe some massages, a free mug, or even a beach towel. Actually heard of a hospital in Florida where the medical staff gave every nurse in their hospital a new Littmann Cardiology IV stethoscope. (I am a huge Littmann fan – best warranty ever!) Now, that is a nice gift! Have you ever wondered what the origins of Nurses Week? Oh, just me? ….well, if you are curious, here’s the history of how we go to this week! But to add to the fun, lots of bloggers and companies love to do Nurses Week Giveaways….so here’s your round up of all the fun and free gifts!! Having been a nurse for over 18 years, I have endured a few Nurses Week. At first I was lured into the charm of my first “Nurses Week” bag. I had finally arrived – my first official nurses bag. I had arrived and for a full week, the folks at the hospital seemed to actually appreciate what we did for our patients. After a few mugs, key chains, beach towels and more bags, the charm quickly grew off. The giveaway has closed – all of the winners have been contacted, however, if I do not hear from them in 48 hours, another winner will be chosen. Thanks to everyone who entered – please support these awesome people and brands who donated these fantastic gifts!! It’s finally here – Nurses’ Week 2015! If you can’t tell, I love Nurses’ Week! I love to have a week to reflect and celebrate nursing. Sure, we should celebrate nursing everyday, every week. But, being nurses, we don’t like a lot of spot light on ourselves. We take care of our patients; it’s what we do. And we do it well – the Gallup poll reports again that nurses are still the most trusted profession! Well, I have some good news – in exchange for being my awesome readers and super awesome nurses, I have rounded up some spectacular gifts to give you all!! They are things nurses want and some are from companies who are made by nurses! Bonus!! So without further ado – here’s what I am going to giveaway to my awesome nurse peeps! UPDATE: Please come back starting in April – will be celebrating all month long the anniversary of my blog with weekly giveaways – ending with a HUGE Nurses’ Week giveaway that is way better than any coffee mug you might get!!! I will also, try to keep up on all the awesome deals, just like last year!! 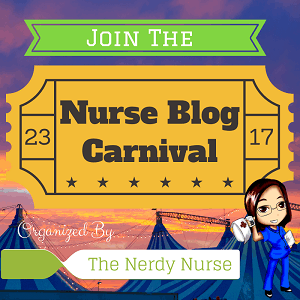 The Nerdy Nurse – don’t forget to enter for some amazing gifts specifically for nurses. And check out her blog while you are there – lots of great stuff. MedEd – they are also having a drawing – $50 Target gift card and a MedEd book. You can’t win if you don’t enter! Cinnabon – super yum! Show your ID and get a FREE Cinnabon. I see a reason to head to the mall!! Lippinocott Nursing Center – they are having daily deals, as well as being able to have free access to their most popular nursing journals, such as AJN & Nursing Made Incredibly Easy. Lots of other great resources, as usual! Go check it out! Johnson & Johnson – The Campaign for Nursing’s Future – they always have awesome resources, but did you know you can get a free magnet for your car! They also have some wonderful posters that you could donate to schools. I have used their coloring books for The Great American Teachin – all FREE!! If we don’t inspire the next generation, who will care for us?? Nurse Together – they want to give you a FREE pin – show you love for how we have to do it together! Another great site for lots of resources for nurses! ANA – they are also holding a give away. Two lucky winners will win an array of nurse logo products! Take 15% Off Select Crocs @ Work Styles with code NURSES at Crocs.com! Ends 5/13 – Love my Crocs! Well, I hope that makes you feel a little loved today! I have also heard some local Dunkin Donuts are giving free coffee – hey, can’t hurt to ask! Thanks for all you do each day and remember to take care of yourself too!! We only get one week so lets just make the best of it, right?? This week I really want to showcase all the awesomeness of our profession! If we are not proud of our profession, who will be?? I know I have posted info on this incredible project before, but in light of nurses week, I thought it needed another spot light! In case you are not aware, this was a beautifully stunning photographic book celebrating the real stories of nurse in America. Nurses magazine has been showcasing their photos on their covers and that is where it first caught my attention. The pictures are wonderful and the stories are just heart warming. It is the perfect gift for yourself and any nurse in your life. The interviews have since been compiled into a documentary. If the trailers are any glimpse of its quality, I know it will not disappoint. This week the American Nurse movie will be screening on May 8 at limited venues. Sadly, it is no where near my home, but hopefully you will get lucky. Please go out and support this film, if you have the opportunity. I doubt you will regret it! You can find more about the American Nurse Project <– click here. So, enjoy your nurses week & if you aren’t a nurse, hug one this week and thank them for saving you from the doctors trying to kill you! Just kidding… kind of!